As I said in a previous post, there’s one and only one way to know whether something is worth or not : whether it supports the enteprise’s strategy, whether not. In the first case it’s worth being done, in the second it’s worth being forgotten. In concrete termes, that mean the only question in the enterprise 2.0 debate should be to explore if, and in which way, it can support strategy. As enterprise 2.0 aims at taking the most of intagible assets, we have to wonder if those assets are really useful or if they’re just “nice to manage”, and if what we put in this big bag called enterprise 2.0 can really help to harness them. This will be the purpose of a coming series of posts. The problem with intangible things is that even if we feel they are very important, i’s hard to mathematically quantify their contibution. We know they help to create value without being able to say how and how much. Because of that, when it’s time to make a decision about investment, this area is often left aside. Since I needed a starting point, my first though took me to the balanced scorecard. Without any prejudice, just because ar first sight I felt there were some possibilities there. My first thought were confirmed : even if it’s reaaly interesting and powerful, it’s often partially applied, and our balanced scorecard becomes unbalanced due to the priority given to the financial side. Norton and Kaplan must have come to the same conclusions since they improved their system with the concept of Strategy Maps. Unfortunately most companies focus on the original concept expressed in 1992. Strategy maps dates from 2001 and obviously too few companies really paid attention to what was really important with that. Of course it’s only a framework that has to be adapted to each particular case but we have things to learn from that. For example we can see that organization capital, information capital and human capital are the base of every formal business process which contribution in value creation we know how to measure. This sound obvious but shown like that it makes things clear. Without the appropriate clture it’s impossible to support any strategy. It’s the same for key competences, information, management methods etc. In 60% cases, enterprises have the right strategy but they fail to support it. Perhaps because fundamentals are neglected. In the coming posts we’ll talk about those differents aspects, what they mean, how to measure them, how to value them. And once we’ve finished we’ll be able to say whether enterprise 2.0 can help, in its technical and organizational side. â€¢ Value creation is indirect : intangible assets don’t create value by themselves, but through their use in business process. â€¢ Value is potential : if business process don’t use those assets, their value remain potential and can’t be fully realized. â€¢ Assets are bundled : intangible assets have to be use in conjuction with tangible assets. For those who want to go furher I recommend you to read the excellent â€œStrategy Mapsâ€œ. 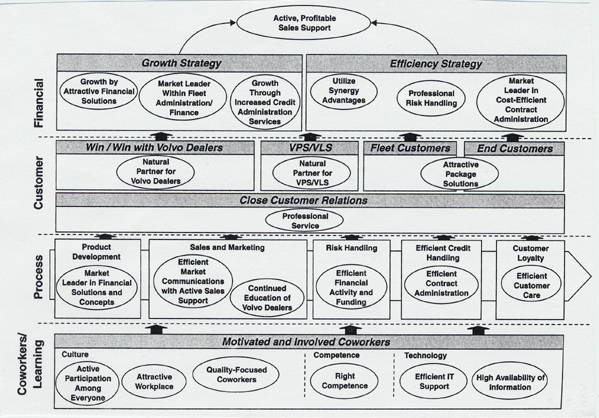 Jun 19, 2008 Developing and managing information capital to support strategy : can enterprise 2.0 help ? Mar 6, 2008 Balanced Scorecard, value creation, and entreprise 2.0 : anyone can help ?